Offering middle school and high school students strategies to succeed on every type of test—from multiple-choice to standardized to essay tests—this book shows students how to maximize their time and skills. 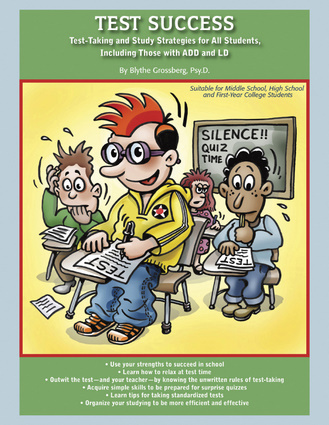 With successful, real-life strategies shared by students, this guide will also help students of all levels, including those with ADD/ADHD and learning disabilities, learn study skills, strategies to handle their anxiety concerning tests, and how to have a mental edge. Teachers and parents can additionally use this book to help students perform better in school. Blythe Grossberg, PsyD, is a learning specialist at the Collegiate School in New York City, and the author of Making ADD Work. She lives in Brooklyn, New York.